According to the Kalapuya Indians, long ago a hero named Tallapus (also called Coyote) came to the Willamette Valley from somewhere far over the Rocky Mountains. At this time, gigantic skookums (ogres) terrified the people of the Valley. Worse still, the Kalapuyas (people of the Pudding River) had no place to catch the delicious salmon that teemed up the Willamette River every season. Tallapus decided to provide fish for the people before he freed them from the worst of the skookums. First, Tallapus tried to make a fishing place at the mouth of the Pudding River. This proved unsuitable so Tallapus moved on, leaving behind a small riffle at the place where the Pudding River meets the Willamette. Next--at Rock Island in the middle of the Willamette River--Tallapus created an even grander design. But this also was not quite right, and Tallapus moved on, leaving behind a strong rapid in the River. Finally, from bank to bank Tallapus constructed the Willamette Falls. There he placed a wondrous machine to catch the salmon for the people. Tallapus instructed the fish-trap to shout out "Noseepsk, Noseepsk" whenever it became full of fish. But so great were the numbers of salmon (at one time said to be so many that a man could cross the river upon their backs) that the amazing machine called out "Noseepsk, Noseepsk" almost without ceasing. Annoyed by the trap's constant summons, Tallapus told the machine, "Wait until I build a fire, and do not keep calling me forever". The wondrous fish-trap was so offended by Tallapus's anger that it instantly ceased to work for all time. Now the people must labor for their salmon but the Willamette Falls remains a scene of great beauty and the perfect place to catch fish. "There are here three falls on a line of rocks extending across the river, which forms the bed of the upper channel. The water is precipitated through deep abrazed gorges, and falls perhaps forty feet at an angle of about twenty degrees. It was a beautiful sight when viewed from a distance, but it became grand and almost sublime as we approached it nearer. I mounted the rocks and stood over the highest fall, and although the roar of the cataract was almost deafening, and the rays of the bright sun reflected from the white and glittering foam threatened to deprive me of sight, yet I became so absorbed in the contemplation of the scene, and the reflections which were involuntarily excited, as to forget every thing else for the time, and was only aroused by Captain W[yeth] tapping me on the shoulder, and telling me that every thing was arranged for our return." In the 1840's, the early European and American pioneers continued to call the Falls the "Hyas Tyee Tumwater", usually translated as "Great Chief Waterfall". The word for waterfall (tumwata or tumchuck) in the Chinook Jargon is based on the term "tumtum," or heartbeat. A tumtum is something's spirit or soul; to the local Indians, the waterfall was the tumtum of the river. For hundreds of generations, the Falls were also the heart of life and trade. 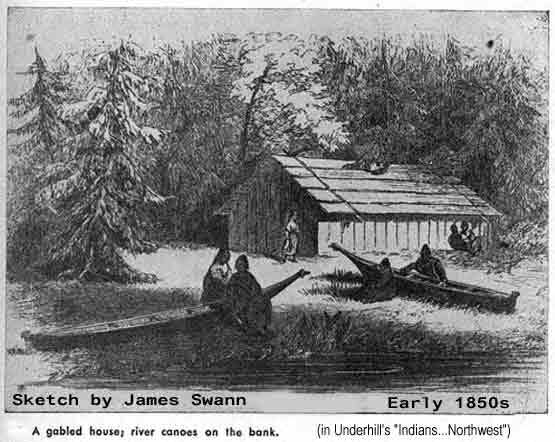 At least three large Clackamas Indian villages thrived along the riverbank between the base of the Falls and the Clackamas Rapids. At this spot the The Clackamas gathered wealth from the plentiful salmon and from trade with other tribes. Salmon at the Falls were plentiful enough to enrich the Clackamas beyond simple survival; other tribes came for trade fairs to purchase salmon or to pay tribute for the privilege of fishing in Clackamas territory. 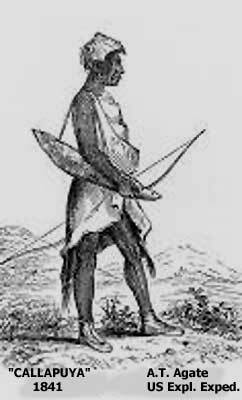 Clackamas County's other two main Indian groups---The Kalapuyas and The Molallas-- visited (and occasionally fought) the Clackamas people at the Falls. Pacific Northwest fisheries --in the days before the arrival of Americans and Europeans--were the richest in North America. Religion in the river tribes centered on First Salmon rites, taboos, and thanksgiving. Abundant salmon, however, was only one of the resources available to people of the Northwest. Along with plentiful game animals, seasonal flocks of migrating birds, and coastal fisheries there were over 100 edible varieties of plants. Most bands spent much of the year migrating over a large region to exploit the Valley's food supply: in early spring they would make forays from winter villages to gather the first shoots of camas roots; in summer, they would live in temporary summer camps to fish, hunt, and gather wapato, camas bulbs, acorns, nuts, and berries; in fall, they would burn prairies to harvest tarweed seed and would catch and preserve the last runs of salmon; in winter, the Oregon Indians would return to their permanent villages. The winter months--late November to March--were the time for community dances that celebrated traditional culture. It was also the time for stories. Around the fire in the cedar lodges, elders would tell the legends and myths that explained the people's way of life and passed its values and morals to the children. The Oregon Trail brought pioneers into a land that had been occupied continuously for more than 10,000 years. Before contact with Europeans and Americans, the people of the Pacific Northwest numbered perhaps a million, certainly in the high hundreds of thousands. These descendants of the very first people to reach the Western Hemisphere had developed a variety of complex cultures, each with its own intricate history and unique way of life. They were divided into several major language groups, scores of dialects, and politically independent households, bands, and villages. Northwest Indian cultures ranged from small groups of horse-riding nomads on the Columbia Plateau to large and permanent villages--typically of 30 to 100 people--toward the coast and in the rich inland valleys. None of the Willamette Valley tribes practiced agriculture, nor were they ruled by leaders who could speak for anyone but their own particular household. They were not simple nomadic hunter-gatherers, however. 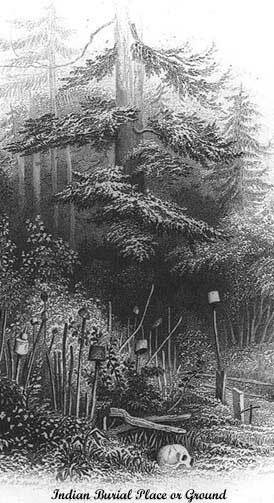 The first people of the Pacific Northwest had developed a sophisticated culture that included some of the features usually associated with cities and farming such as: a hierarchy of status; techniques to harvest and store large quantities of food; specialized occupations; a widespread system of trade; and large, permanent homes. Traditionally, Oregon Native Americans did not regard themselves as part of a large political (or linguistic) group but instead identified only with their local band, a group of 10 to 80 people connected by blood or marriage. There was little conflict with neighboring bands other than skirmishes over marriage alliances, honor, or prime resources such as fishing sites. Occasionally there were larger alliances and bigger territorial wars. The region that would later become Clackamas County was home to over a dozen bands or villages of Indian people, classified (according to language) into three groups--Kalapuyan, Upper Chinookan, and Molallan. KALAPUYAS occupied the inland valleys of western tributaries (such as the Tualatin River) to the Willamette and--above Willamette Falls--the eastern tributaries plus the shores of the Willamette River itself. Over time, the Kalapuya speakers had split into three main language groups-- Yoncalla, Santiam, and Tualatin/Yamhill --and each of these three languages into scores of dialects. In the Clackamas County area, the people spoke two dialects of Kalapuyan and were divided into two main language divisions-- Ahantchuyuk (Santiam Kalapuya speakers) and the Atfilati (Tualatin Kalapuya speakers). 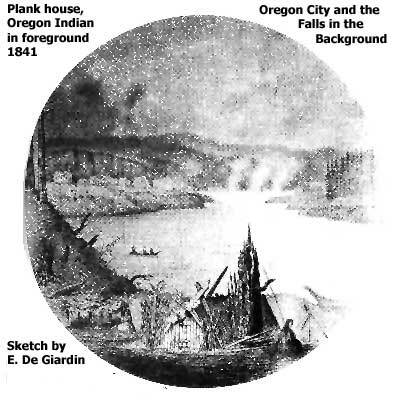 The Ahantchuyuk (sometimes called the Pudding River or French Prairie Indians) held territory from just north of present-day Salem, across French Prairie to the upper Willamette Falls, and along the Pudding and lower Molalla Rivers. 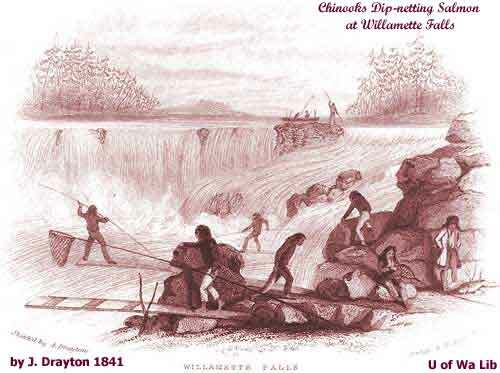 Indians above the Willamette Falls were called the Wil-lamt and those below the Multnomah (who were Upper Chinooks, not Kalapuyans) . The Atfilati Kalapuya centered around the rich food supply at Wapato Lake on the Tualatin Plains but seasonally migrated to Oswego Lake for the abundance of roots, fish, and waterfowl and to the Falls for salmon. Also called the Tualatin Indians, the Atfilati people occupied about 24 villages on the Tualatin Plains and River, the hills around Forest Grove, the north fork of the Yamhill River, and the vicinity of present-day Portland. Below the Falls, Upper CHINOOKS lived in villages along the Willamette River, the Clackamas River, and along the Columbia upstream as far as Celilo Falls and downstream nearly to the coast. Very roughly (the Indians recognized no larger political unit than the household or village) the Upper Chinooks were divided into the Multnomah of the western Willamette riverbank and Wapato (Sauvies) Island and the CLACKAMAS of the eastern Willamette riverbank and the valleys of the Clackamas and Sandy Rivers. The band of Clackamas (Upper Chinook) who occupied the Falls area on both the east and west banks were called Clowwewalla. Further inland in the region that would later become Clackamas County, the MOLALLAS held the upland valleys and western slopes of the Cascade Mountains. Compared to the Kalapuyans and the Chinooks, the Molalla lived in smaller bands and less substantial dwellings. Unlike the river tribes, the Molalla were horsemen with a lifestyle based on wide ranging hunting and trade. They traveled north to the homeland of the Wasco (a Shehaptin language people) at the Columbia River Dalles for trade and regularly welcomed Klamath visitors from the south. The heart of the River at the Falls eventually became Oregon City, the center of American commerce and government for early Clackamas County and the Oregon Territory. Today a dam stretches from bank to bank to tame the flow over the Falls while locks and a fish ladder cut into its rocky face. The transformation of the Falls--from an Indian communal and spiritual center to an American center of commerce--began long before the first wagons rolled down the Oregon Trail. Disease was the first invader of the Oregon Country, beginning in the late 1700's, decades before the arrival of Lewis and Clark. While wars and forced relocation contributed to the disaster, these hardships were imposed on a people that had already lost nine-tenths of their tribe to disease. Chinooks like the Clackamas and Oregon's coastal tribes had the earliest contact with European and American explorers and traders and were the most devastated by years of plagues that followed 1780's. Diseases previously unheard of in the Northwest--especially smallpox--may have been introduced through inland trade even before the first contact with European voyagers. Measles, malaria, and other illness followed continual outbreaks of small pox. In the late 1830's the Clackamas's traditional rivals, the upriver Kalapuyas, maintained a village below the Falls on former Clackamas territory. Klikitats and Molallas moved into former Kalapuya territory in western Clackamas County. Many Kalapuyans intermarried with these or other tribes or with white settlers. Meanwhile, by the early 1840s, Klikitats from north of the Columbia River moved into northern Oregon. Within a few years, disease and dispersal also devastated these and other tribes of the Pacific Northwest. In a single generation everything changed. By the time of the first emigration on the Oregon Trail--1841--very few of Clackamas County's first people remained. 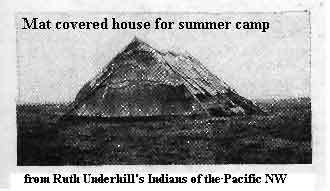 A remnant of the Kalapuya-Tualatins survived on a tiny reservation near Wapato Lake, some Molallas retreated south to live among Klamath allies, and the rest of the original Willamette Valley people survived only in tiny pockets near white communities. In 1855, the Tualatin reservation closed and the 80 remaining Tualatins removed to the Grand Ronde Reservation. The young people of other Willamette Valley tribes scattered to Grand Ronde or to reservations at Siletz and Warm Springs. A majority of Willamette Valley Native survivors relocated to Grand Ronde Reservation in the 1850's, while others remained in isolated families throughout Clackamas County. Only a very few of the oldest Clackamas people lived out their days on homeland near the whites. Until the early 20th century, many Indians or half-Indian people would travel between the Reservation and their former homelands. Before the 1950's, the last generation of Kalapuya speakers were gone and the population of Grand Ronde had adopted Chinook Jargon as a common language. Today, descendants of the first people of Clackamas County are part of the Confederated Tribes of Grand Ronde, a community of five tribes (Kalapuya, Molalla, Umpqua, Chasta, and Rogue River) that preserves a common culture in a place far from their traditional lands. The MOLALLA, KALAPUYA, AND CLACKAMAS CHINOOKS no longer exist as separate tribal entities. Reservation life mingled the remnants of many tribes and most Oregonians of Indian descent live off-reservation throughout the Northwest. The heritage of bloodlines and culture, however, survives. Reservations preserve values and cultural heritage while providing a focus for Native American identity.